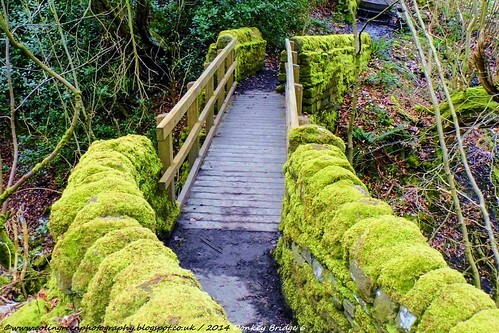 Colin Green Photography: Donkey Bridge, Norland. Donkey Bridge crossers the Maple Dean Clough, Near Norland, West Yorkshire. It can be found by following North Dean Road up from Copley to the hairpin bend and then following the woodland path in the direction of Norland, or alternatively from Norland you follow Pickwood Lane towards the end and a small steep cobbled path down to the bridge is hidden away here. Normally in the summer this is quite overgrown, and in the winter gets very wet and icy. There has been a bridge crossing here for many years and the stream is the boundary between Greetland and Norland on the edge of North Dean Woods. There are photo's available on other sites that show a bridge before the woodland grew up around it. These pictures were taken in March 2014 using a Polaroid iS2132 digital bridge camera and all 9 taken in the area of the bridge can be seen on Clickasnap or Flickr. The following 3 links will take you to the pictures available on Clickasnap. They open in another window and can only be seen there. Each view of over 10 seconds helps support my photography and they will shortly be available to buy as a download for £1. 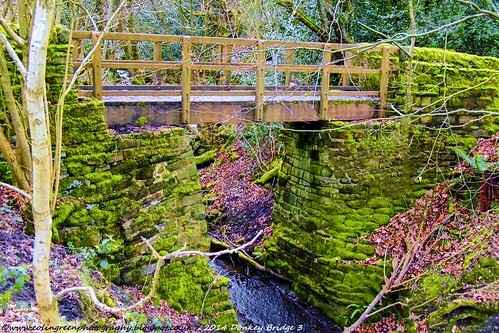 This shows a colour A4 sized picture of the bridge crossing Maple Dean Clough taken from the Norland side of the crossing. The Path to Donkey Bridge. This shows a colour picture taken from the Copley side a short distance away, highlighting the crooked path towards the bridge. 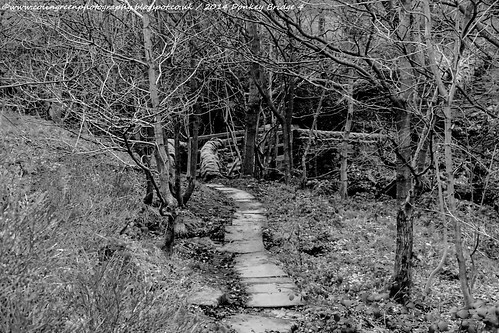 A black and white picture taken on the Copley side looking away from the bridge towards North Dean Woods. It shows the crooked and unstable path passing through the trees. The Flickr album above can be seen by using the arrows or full size by clicking the link and being taken to Flickr. It features 6 pictures taken at or near the bridge. The following 2 pictures are also from the Flickr album. The Worlds largest free to use, paid per view photography sharing site.